Special education teachers help children with special needs. Special education teachers work with students with varying disabilities, which include learning disabilities such as reading and math disabilities, mental retardation, autism spectrum disorders, visual impairments, hearing impairments, ADHD, emotional disturbances and physical disabilities such as cerebral palsy and spina bifida. 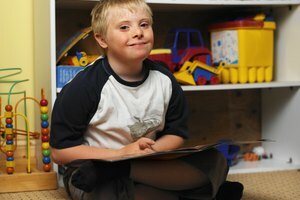 Most commonly, children with special needs within the public school district receive the majority of their instruction in the regular education class with nondisabled peers, but those children with severe cognitive impairments may receive instruction in a self-contained classroom with other severely impaired special needs students. Each child with special needs must have an individualized education plan (IEP). The special education teacher both writes and implements the IEP. Special education teachers should always accommodate special needs children so that they can succeed academically. In addition, special education teachers should modify class work for special education students. Special education teachers who work with inclusion students who spend most of their day in a regular classroom should ensure that the regular education teacher knows how to accommodate the student and modify work for the student as well. Special education teachers need to bond with the special needs students. Bonding with students helps to motivate students to try their best and allows students to feel comfortable asking for help. Special education teachers should also aim to create a good, working relationship with parents. Parents should feel comfortable contacting the special education teacher with concerns and suggestions. Special education teachers should track the progress of all students with IEPs on a regular basis. At the very least, students should be assessed at the end of each grading period. Teachers should inform parents about the student's progress through progress notes and report cards. An important goal for all special education teachers involves keeping paperwork updated and organized. Special education paperwork includes IEPs, eligibility paperwork, re-evaluation paperwork, progress notes, report cards, copies of parent communication and student work portfolios. Hughes, Melody. "Goals for Special Education Teachers." Synonym, https://classroom.synonym.com/goals-special-education-teachers-6744169.html. Accessed 22 April 2019.